Located in El Paso's trendiest restaurant area and directly across from the UTEP campus and the Don Haskin's Special Event Center, Miner Village is one of El Paso's hottest shopping and eating destinations! Miner Village Shopping Center is a 30,000 square foot outstanding new shopping center completed in 2005 and directly in front of the Don Haskins Special Events Center along Mesa Street in El Paso. Nestled between a new Albertson's Supermarket and a new Walgreen's Pharmacy, this outstanding retail center is a beautiful addition to the established University of Texas at El Paso neighborhood. Located directly across Mesa Street from the University of El Paso's Special Events Center, Miner Village offers unparalleled visibility to the thousands of University students and staff that commute to and from the University. The Special Events Center is also host to year-round sport and entertainment events that have seen record attendance in recent years. 1,000,000 people visit the Haskins center every year. The University area is also home to many of El Paso's most popular nighttime destinations including a myriad of clubs and lounges that cater to young professionals, as well as students. Miner Village is also in the heart of El Paso's most popular neighborhood, Kern Place and minutes away from Mission Hills and Rim Road, two thriving residential markets. In addition there are 300 new student housing apartments located just across the street. In addition to the many business offices and retail locations in the University area, Miner Village is minutes from three of El Paso's largest hospitals, as well as many ancillary medical care facilities. Retail = 25,440 sq. ft.
1 space per 250 sq. 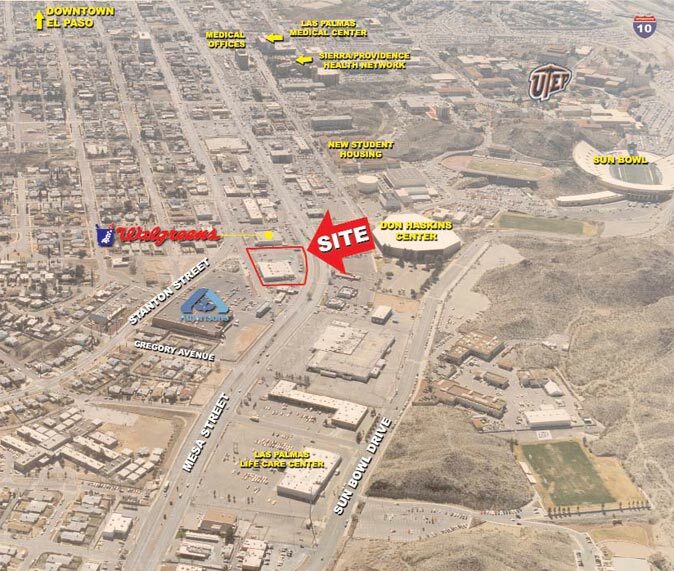 ft.
Additional parking will be provided with the approval of a 500 space parking garage planned for 2006 across the street to be built in a collaborative between UTEP and the City of El Paso.